The view of Mount Marcy near the winter tree line. Photo by Phil Brown. The equinox occurred on March 20. The baseball season opened on April 2. 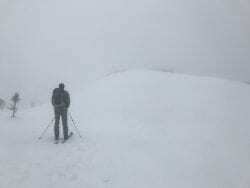 Nevertheless, spring has not arrived on the top of Mount Marcy. I skied Marcy this past Monday and found good conditions from Adirondak Loj all the way to the summit (see videos below). With this week’s rain and warm weather, conditions won’t be as good this weekend, but the snow at higher elevations will be around for quite a while. The last signpost on Marcy, about a half-mile from the top, was mostly buried, with just a foot or so sticking out of the snow. 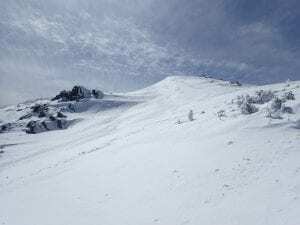 Hikers and snowshoers sometimes forget—or don’t realize—that snow at higher elevations can linger for weeks after it disappears in the valleys. And that skiers may still be skiing the summits when it’s 65 degrees at the trailhead. On my trip, I encountered six other skiers—and this was a Monday. Incidentally, only two of the six were local. Mount Marcy’s summit. Photo by Phil Brown. I also saw four hikers bare-booting toward Marcy Dam. 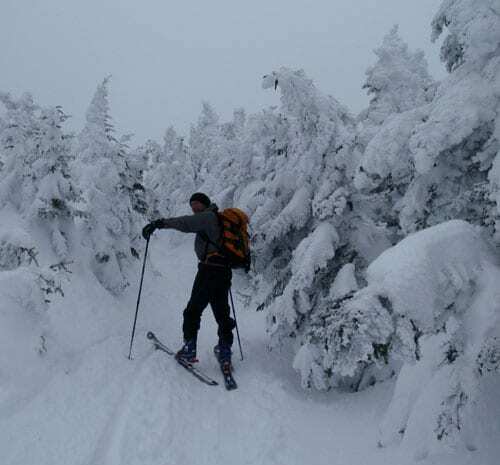 Regulations for the High Peaks Wilderness require hikers to wear snowshoes if the snow is at least eight inches deep. The aim is to prevent post-holing. In this instance, though, the trail was hard as ice, and their boots hardly dented the surface. When I caught up with them at the dam, I saw they were carrying snowshoes. “We didn’t ruin your trail, did we?” one asked. “We’d put on our snowshoes then,” she said. As spring progresses, the weather warms, and the snow softens, it will make a difference: bare-booters could do a lot of damage to a trail. 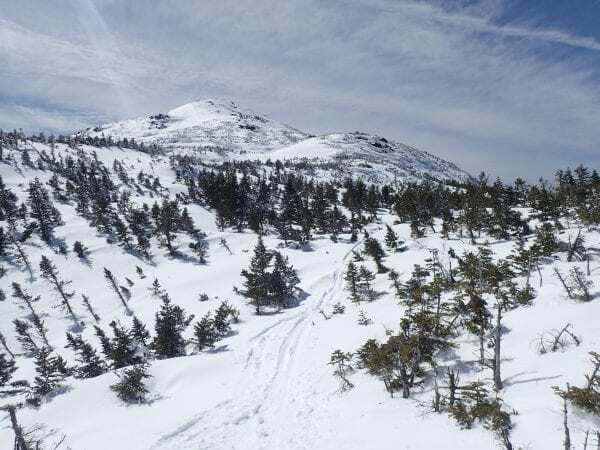 I remember skinning up the Marcy trail on a warm spring day and encountering a hiker on the ridge above the Corkscrew (a steep, twisty section of trail) who was sinking up to his knees in snow. He was frustrated. I was annoyed. “You should be wearing snowshoes,” I admonished. “The season’s over,” he rejoined. Right. That’s why you’re up to your knees in the stuff. Another time I was skiing down the Corkscrew when I saw several snowshoers gathered at the bottom. I yelled a warning, and they stepped to the side—all except one. I had to do a quick stop. It turns out these snowshoers had been bare-booting for miles. They finally decided to put on their snowshoes after sinking continually into the snow. It didn’t occur to them that the base of the frequently skied Corkscrew is not the best place to stop. The reason that one guy didn’t move is that he had sunk up to his thighs. If you’re heading up Mount Marcy in spring, or any of the High Peaks, don’t be fooled by balmy conditions downstate or at the trailhead. It may still be arctic-like on the summit. 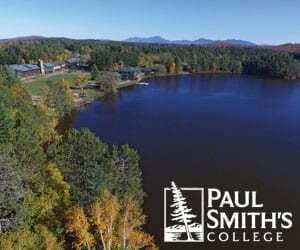 Indeed, one time I skied Mount Marcy and played golf, in Ray Brook, on the same day. 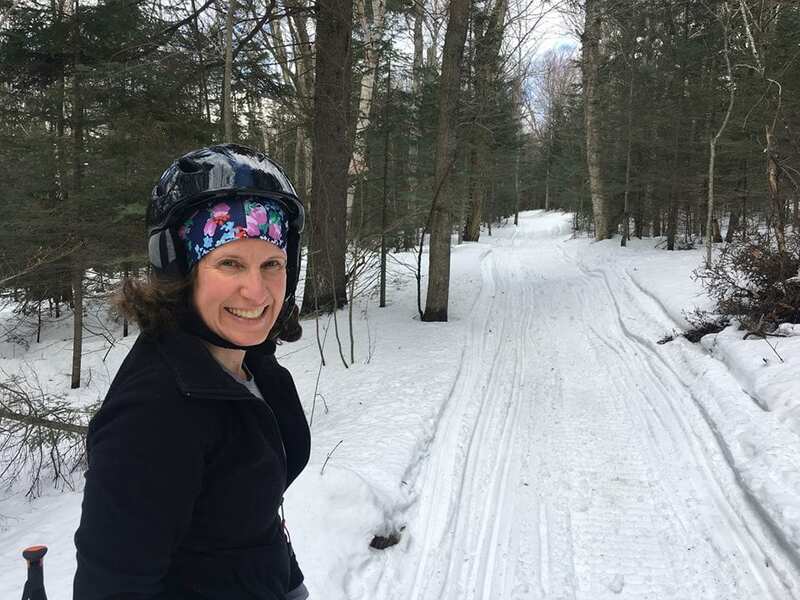 On another occasion, I started skiing from the Loj on a warm day in late April, and though I was sweating much of the way, when I reached tree line, I encountered a fierce wind and freezing wind chill. I put on a winter hat, gloves, and puffy jacket. Continuing upward, I passed a hiker in shorts. He looked miserable. So check the conditions before you head up high. If there’s snow, bring snowshoes. Here are conditions for this weekend from Adirondack Almanack, the online journal owned by the Explorer. I recorded two short videos on my trip. The first was taken on my descent of the summit cone. The second was taken on the cruise along Phelps Brook, a mellow section but a bit rocky. Enjoy!